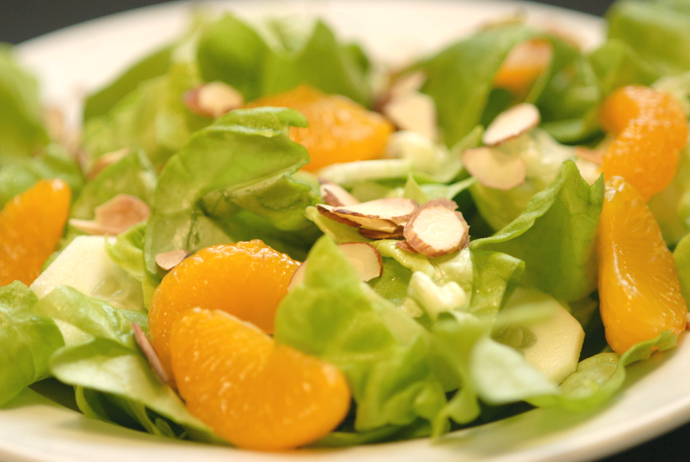 This simple dish hits on just about every flavor point, sweet and sour from the mandarin oranges and dressing, salt and savory from the flank steak, crunch from the almonds and squishy-juicy from both the fruit and the meat. 1. For the Flank Steak: Peel the ginger with a spoon or vegetable peeler and slice into approximately 4 pieces. Peel and smash the garlic into slightly broken cloves. Place both ginger and garlic into a re-sealable bag. Pour wine, soy and agave nectar into the bag. Shake vigorously, then add the flank steak. Marinate for about an hour. 2. Build your fire or pre-heat your gas grill. If using coal let the heat reduce to a 3 second hand fire (about 375°). 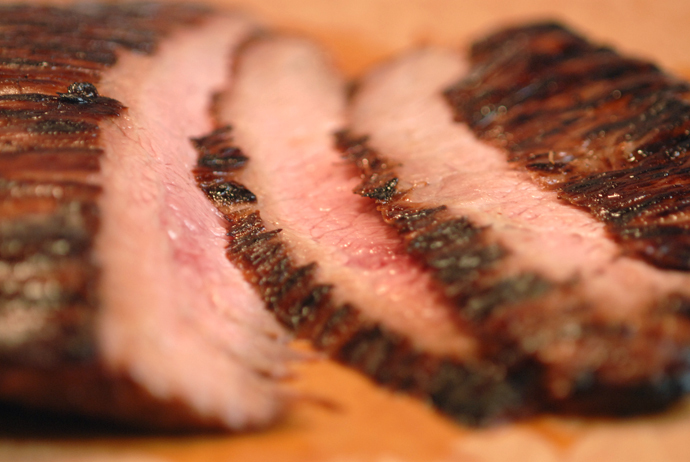 This is a hot and fast cooking method as the flank steak has little fat and is normally fairly thin. Grill about 3 minutes a side. When steak has reached 145° internal temperature, slice thinly across the grain. 3. For the Salad: Chop, rinse and dry the lettuce. In a small pan, toast the almonds to a light brown and let cool. Peel the cucumber and slice thinly. Place 1 tablespoon of the reserved mandarin orange juice into a cruet or bowl. Add the oil, vinegar, soy, sugar, salt and pepper and shake or whisk vigorously until fully incorporated. Toss the lettuce, cucumber and mandarin oranges with the dressing and place in four bowls. Garnish with toasted almonds. This entry was posted in recipes and tagged asian, barbeque, BBQ, beef, cooking, dinner, dish, entree, food, grill, healthy, lean, light, main, recipe, salad, side by MixedSoup. Bookmark the permalink.